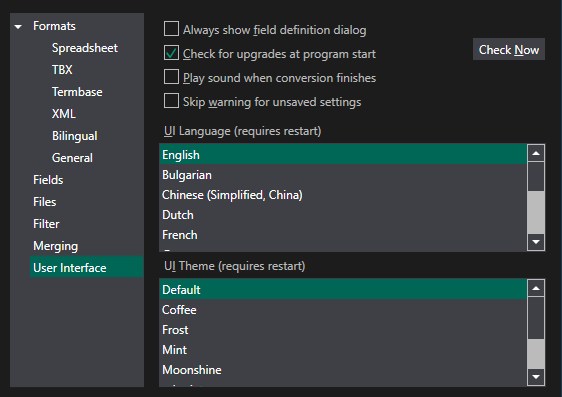 The UI Language determines the language used for dialogs and messages. By default, the Windows locale is used. If that is not supported, the fallback is English. Currently, localisation exists for English, German and Spanish. The UI Theme is just there for a bit of fun. You can change the colours and icons used in the application. Some examples are provided, but you can also create your own. In the program installation, you'll find a folder called Themes. There's an xml file controlling each theme, and you can add new folders and play with the colours and icons as much as you like. The file format should be reasonably self-explanatory. 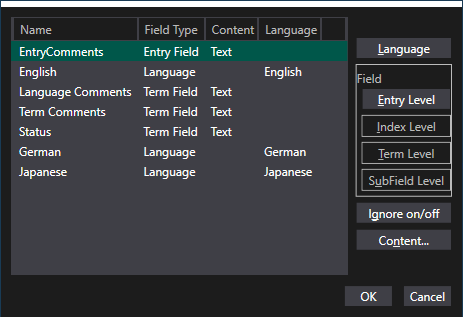 In that case, check the Always show field selection dialog check box.The field definition dialog will always be displayed, showing all fields, not just unknown ones. When the program starts, it does a check for updates, and pops up a dialog if there is one. If you want to keep an old version and not be nagged by the upgrade message, untick this box. You can always check manually, using the Check Now button.